Single bed sizes in the UK have traditionally been 3ft wide by 6ft 3in long. In recent years more variations of the single have been becoming more common. These sizes include the long single (3ft or 92cm) the metric single (3ft 3in or 100cm) and the large single (3ft 6in or 107cm), each size in a variety of bed lengths. We make a wide range of bedding for all single size beds including valances, duvet covers, fitted sheets and protectors. We have listed each size below so you can find correct size. Please choose your size and product from the left hand column, (or click open filters if viewing on a mobile). If you have any questions or require fabric samples please call us on 01706 220020 or email us we'll be happy to help. Metric Single Satin Stripe Fitted Sheet, 100% Cotton200 Thread Count Cotton sheet in stylish satin s..
3ft x 6ft 3" (90 x 191cm) Single Valance SheetAvailable in 11 ColoursMade to any drop required.A col.. Single Fitted Sheet in Poly Cotton - 11 ColoursFitted sheets to fit 3' x 6'3", 92 x 191cm sizes..
Long Single Satin Stripe Fitted Sheet, 100% Cotton200 Thread Count Cotton sheet in stylish satin str..
Waterproof Duvet ProtectorProtect your duvet. Keep it box fresh with a good quality, zip fastening 1.. Extra Deep Single Fitted Sheet in 100% Egyptian CottonTightly packed yarns of beautiful Egyptian Cot.. Single Cotton Fitted SheetFine 200 threads to the inch buttery Ivory fitted sheet, in natural 100% C.. 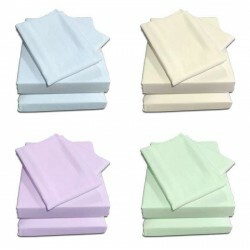 Single Fitted Sheet in 100% Cotton FlanneletteRelax in super soft 175gsm fitted sheet in 100% Brushe..